If good training regattas are ones held in the widest range of conditions, then the RORC Easter Challenge is scoring highly. Today's racing was held in the central/eastern Solent in moderate conditions that turned light as the northeasterly wind swung heavily right during the early afternoon, while bigger conditions are forecast for tomorrow. With four races scheduled, two were successfully held before the wind turned inside out. As the RORC Easter Challenge's new PRO, Stuart Childerley, recounted: "For the third race, IRC Four and One managed to just get upwind over the tide before the wind dropped, so we shortened them. Meanwhile IRC Two and Three were trying to start and half of the fleet were still trying to get over the line four minutes after the start. So we pulled the pin." After a brief pause the AP over A was hoisted sending the fleet home early. However this provided more post-race debrief time for Jim Saltonstall, his colleagues and, from across the pond, the North U Regatta Services team of Andreas Josenhans and Chuck Allen. At the close of play, Anthony O'Leary's experienced team on the Irish Ker 39 Antix is leading IRC One, but is just 1.5 points clear of Christopher Opielok's Corby 38 Rockall IV, on which Ben Ainslie's former coach David Howlett is sailing. The lead three boats in IRC One each won races today with James Gair's Cowes Race School team on their Mills 39 Zero II claiming the third in heroic fashion. As Gair proudly described it: "We port tacked the whole fleet despite being the lowest handicapped boat... The boys were going 'are you serious?' And I said 'we are going for it!' So we crossed the fleet, led them into the beach where there was less tide and more pressure. We ended up going around the windward mark on Tokoloshe's stern and winning the race." Otherwise Gair compared today's conditions to being like snakes and ladders, and it being vital to get the best start. His crew has made use of the free coaching laid on by the RORC at this regatta. "They have been looking at our headsail trim and getting our crew weight in the right place for our fore and aft trim, which is hard to do without having someone in a RIB. Jim [Saltonstall] came past and said we were looking 'like a good bunch of ferrets...'"
From the Netherlands, the de Graaf family on Baraka GP are using the regatta as a chance to get back in the groove after a six month break from racing their Ker 40. "Our boat handling went well today, but our tactics were a bit off," admitted Mees de Graaf, nodding towards his eldest brother with a grin. "And our speed when it got light was a bit slow," he added, referring to today's last race. The Baraka team hasn't been making use of Jim Saltonstall's coaching as, for this, they have their own secret weapon..."our mother!" Mees explains. "She is in the RIB and takes all the photos of us and gives us a 'nice' opinion about why we are behind. She is the boss and we have to win..."
In IRC Two, the results are tight with Guernsey's Simon Henning and his crew on the Mumm 36 Alice, one point ahead of James Neville's smart-looking Corby 36 Ino in second, after the latter scored two bullets in today's first races. Three boats are currently tied on 11 points at the top of IRC Three with David Franks' former IRC Nationals winning JPK 10.10 Strait Dealer, tied with Mark Devereux's Ker 32 Raygun and Dunkerque Plaisance-Gill Racing Team, the French A-35 of Benoit D'Halluin. The Raygun crew have previously sailed Devereux' Swan 42 Brevity and swapped across to their new boat after they acquired her over the winter. "We thought we'd get something to have a bit more fun in," explains helmsman James Anderson. "There are a few good boats at the top of our fleet and without a discard it is about getting good consistent finishes. We want to be on the podium at the end of tomorrow so that we can win a few Easter eggs!" The runaway train of this year's RORC Easter Challenge remains Louise Morton's all-female crew on her highly successful Quarter Tonner, Espada. Their 3-1-1 scoreline today leaves them 12 points clear of the nearest competition, another Quarter Tonner, Sam Laidlaw's Aguila. The Southworth family's Quarter Tonner, Whiskers, is currently in lowly eighth, thanks to scoring an OCS in today's second race. 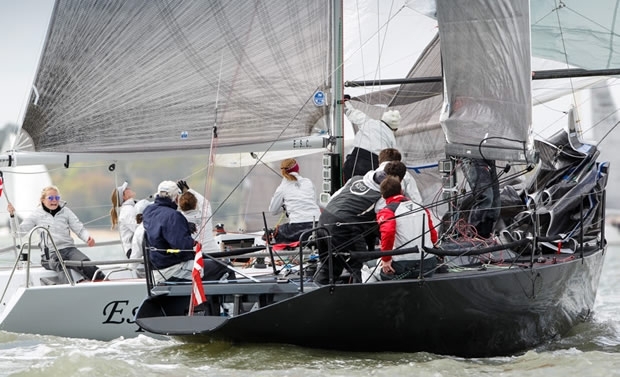 They are at the RORC Easter Challenge with an all-star cast on board, but this is the first regatta of their season and they have made substantial changes to their boat over the winter, including a new rig. "It's been pretty challenging on the brain with very very shifty conditions," admitted helmswoman Liz Rushell. "But it's a training regatta which has been perfect for us as we've been trying a few things out across the range of conditions." Tomorrow is the last day of the RORC Easter Challenge and brisker conditions are forecast with 20+ knot gusts expected. "It will be a big day tomorrow, but we'll get as much racing in as we can," says PRO Childerley.